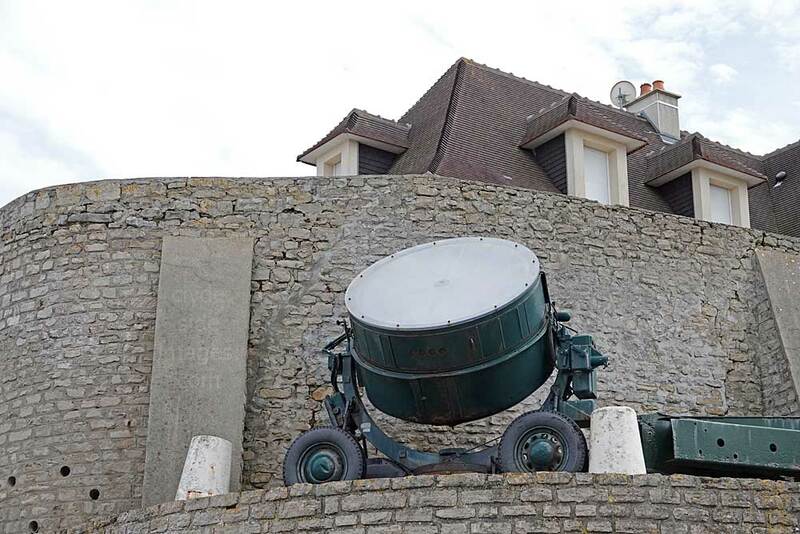 The picturesque nature of Arromanches-les-Bains, it's significance in the landings, with an excellent museum, and the variety of accommodation on offer, means that the town gets extremely busy in summer, especially around 6 June each year for the D-Day anniversary commemorations, and again for Armistice Day every November. 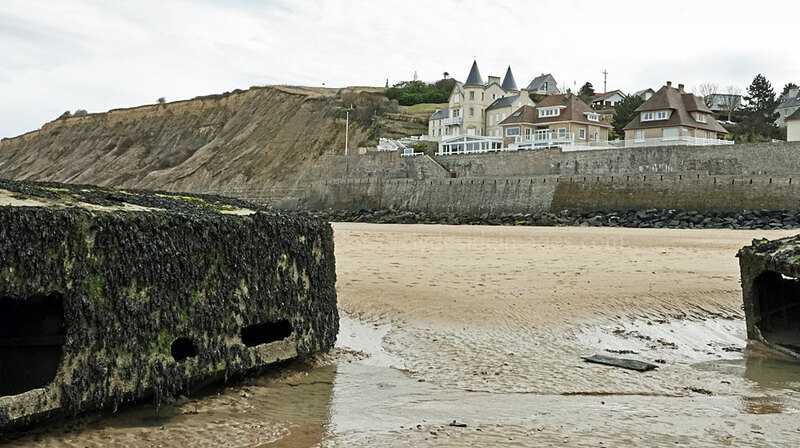 ​Arromanches, situated at the west end of GOLD beach, was not directly attacked on D-Day as it was earmarked for the placement of one of the two Mulberry harbours. Plus the town had been heavily fortified by the Germans who were well aware of its strategic importance. Houses were demolished to improve fields of fire with anti-tank and machine guns sited to sweep the beach. Aerial and naval bombardments before the troops landed further along the coast successfully knocked out some of the strongest defences here but the Allies didn't approach from the sea. 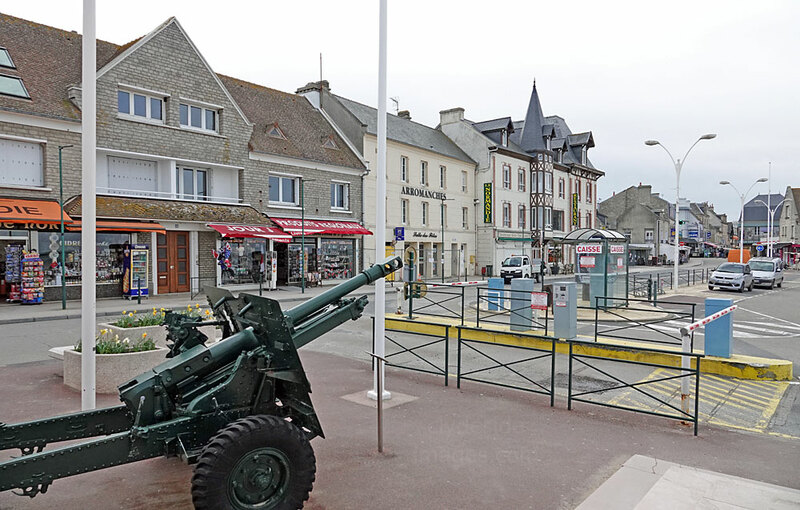 ​The town was liberated by the 1st Battalion, Hampshire Regiment, who came ashore further along GOLD Beach and entered the town from the heights of Saint-Côme to the east. It took most of the morning to dislodge elements of the German 352nd Division but, despite naval gun-fire support, there was very little damage to the town itself and only six civilian fatalities. 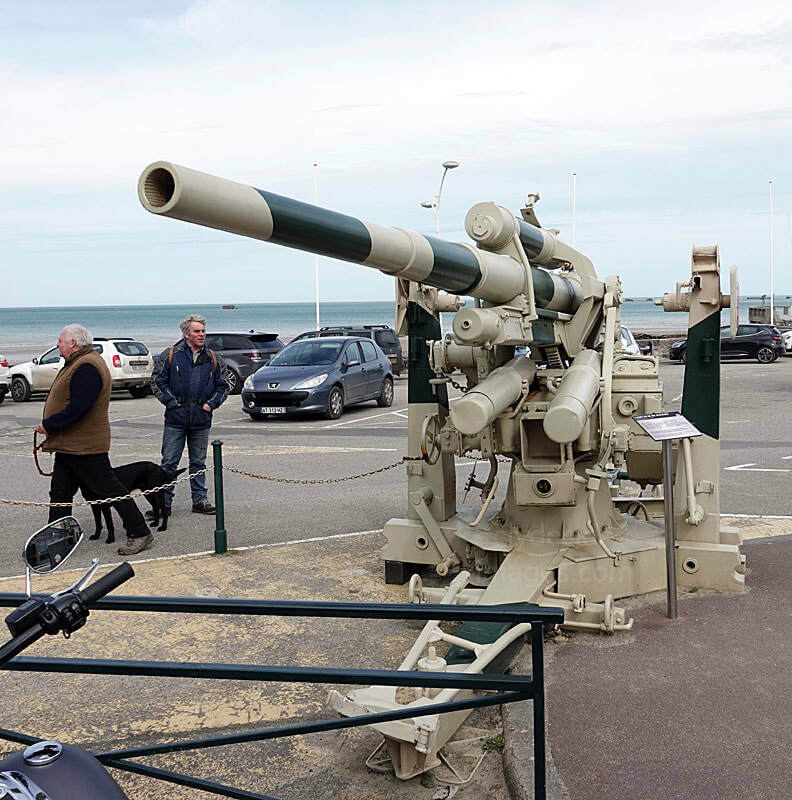 This 88mm gun is on display in the main car park on the waterfront adjacent to the town`s D-Day Museum. 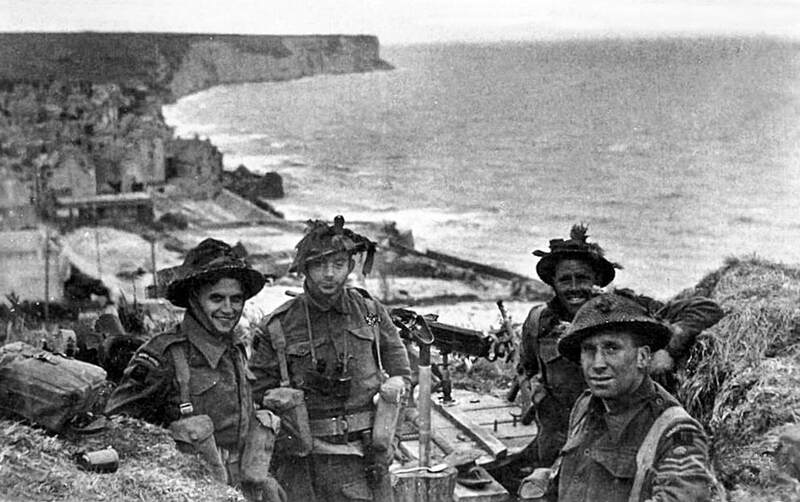 Men of the Hampshire Regiment dug-in on the heights to the east of Arromanches on D-Day. Their location is atop the cliffs shown in the photo below. 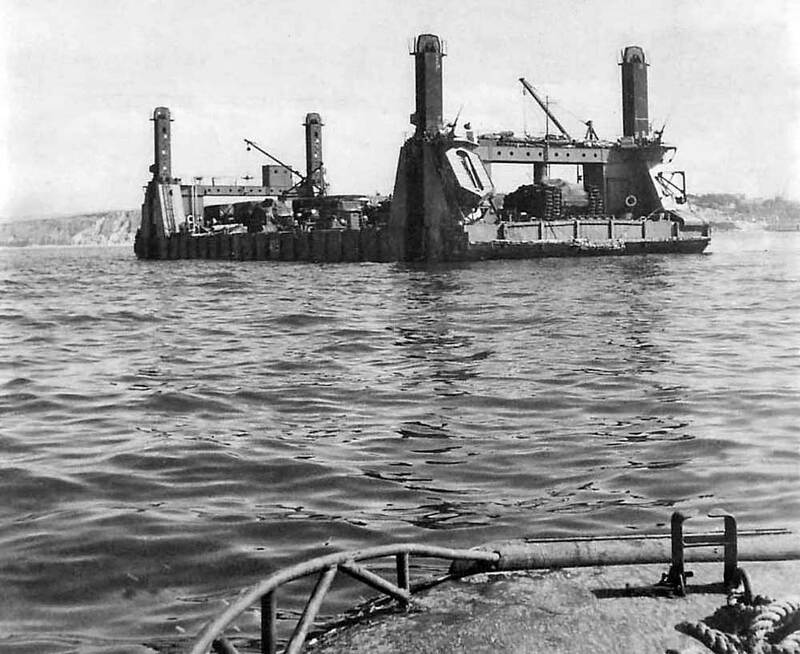 The two artificial Mulberry harbours were designed and constructed in secret to facilitate the unloading of transports and cargo vessels immediately after a foothold was secured on mainland Europe following the invasion. The need for an artificial harbour was identified following the failed amphibious raid on the French port of Dieppe in August 1942. 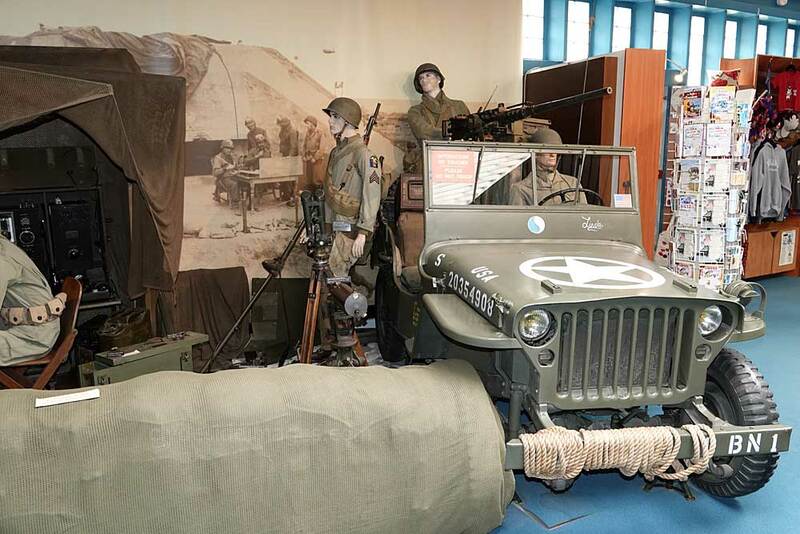 With the nearest deep water port to the Normandy landing grounds being at heavily defended Cherbourg, 50km away on the top of the Cotentin Peninsula, it would take considerable time and effort, and many casualties, to capture the facility and make it operational. 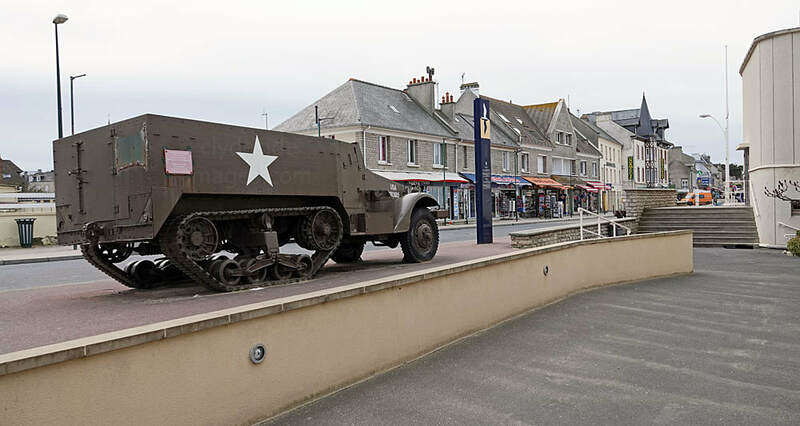 One harbour, known as Mulberry A, was assembled off Saint-Laurent at OMAHA Beach in the American sector, and the other, Mulberry B, was created off Arromanches where large section can still be found. The Americans had to return to the old way of doing things: bringing landing ships in to shore, grounding them, off-loading the ships, and then refloating them on the next high tide but the once the British Mulberry (above) was back in action it helped support the Allied armies for 10 months. 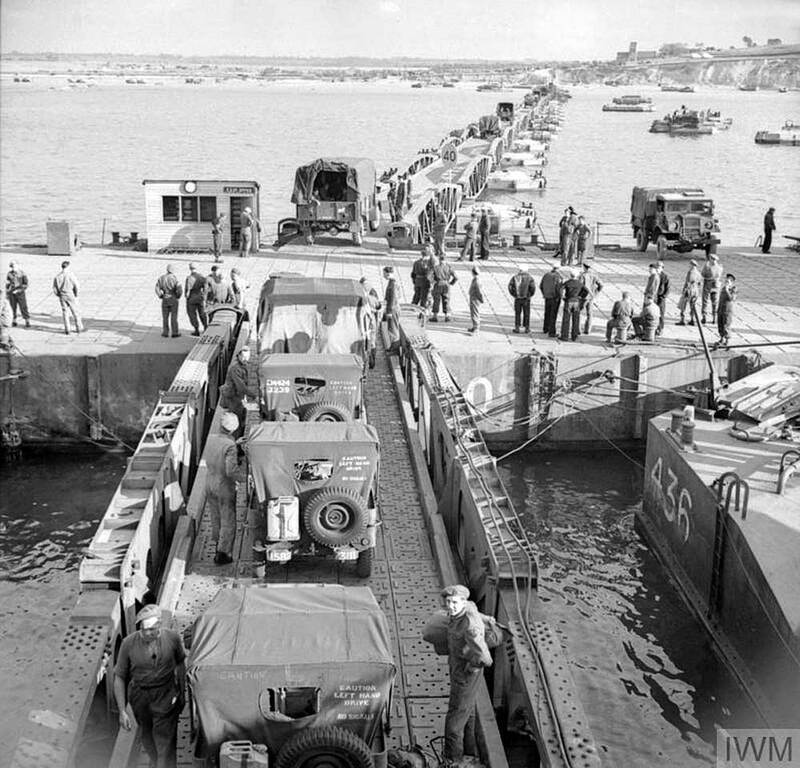 Two and a half million men, a half million vehicles, and four million tons of supplies landed in Europe through the artificial harbour at Arromanches. 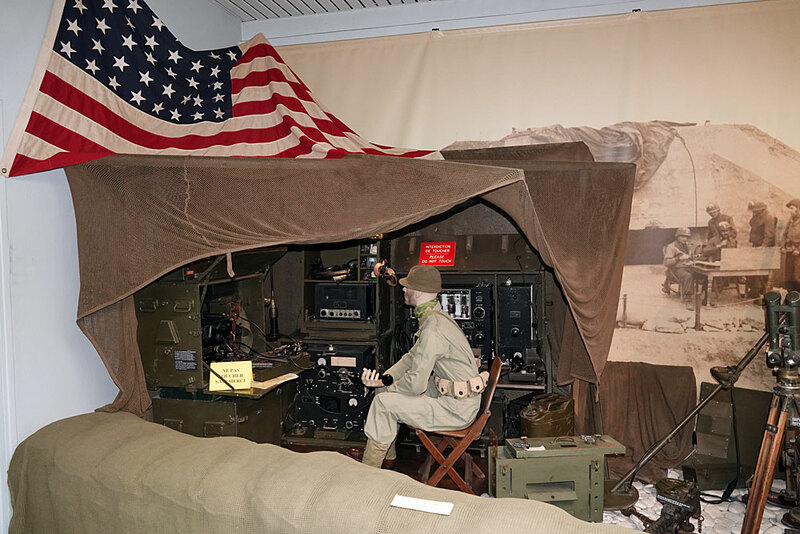 ​However, some military experts and historians have since argued that landing men and materiel on the beaches via lines of sunken blockships and smaller prefabricated jetties, or beaching directly onto the sand, such as the Americans resorted to at OMAHA, could have been just as efficient while saving a fortune in man hours and money, especially considering the vast cost of materials, and difficulties in transporting the finished components to Normandy. Whatever the case, there is no doubt that the Mulberries were a remarkable feat of engineering.​ A separate page has more information and photographs. Click here to view. 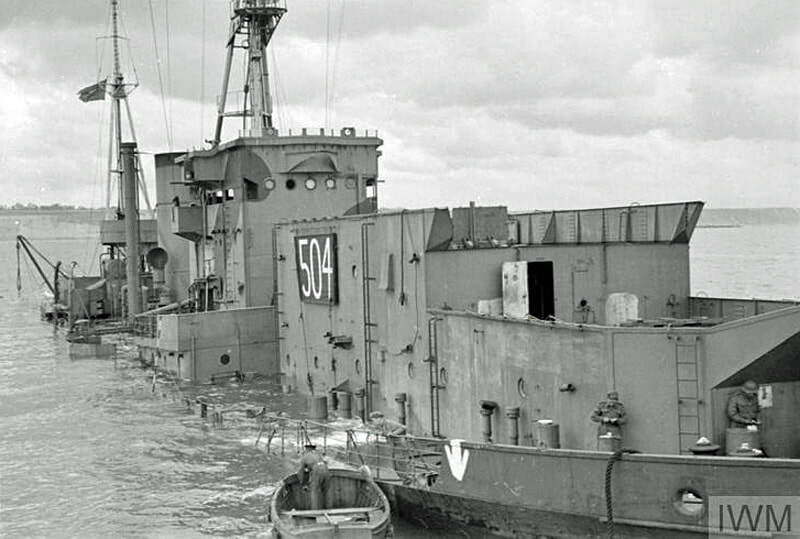 Above left: HMS Alynbank (F84), an anti-aircraft vessel was the first blockship to be sunk to form the outer breakwater for the Mulberry harbour at this location. She was built by Harland & Wolff Ltd at Govan, Glasgow, launched on 15 January 1925 and commissioned on 16 Jun 1940. 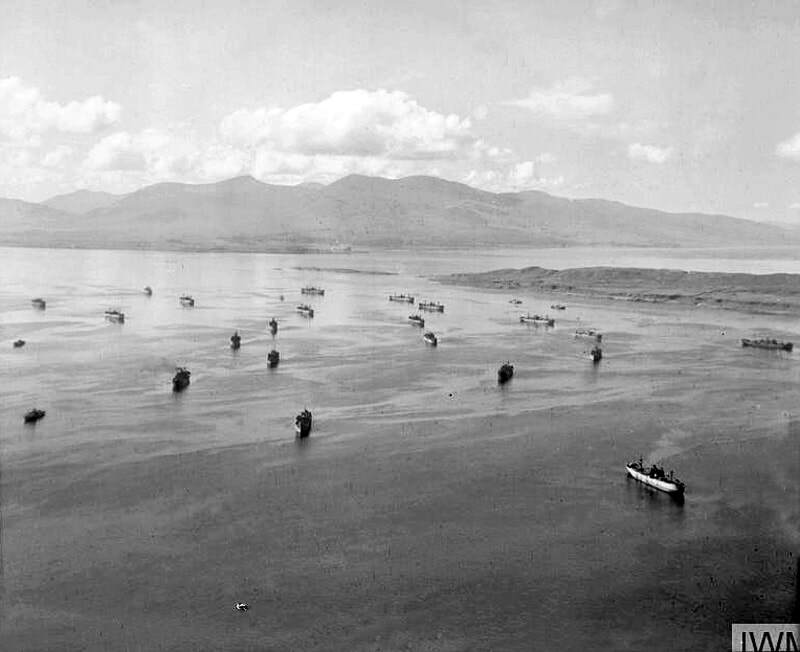 The above shot was taken on 9 June 1944.​ The adjacent image shows other Blockships to be used off the invasion beaches assembled at Oban prior to them relocating to southern ports. 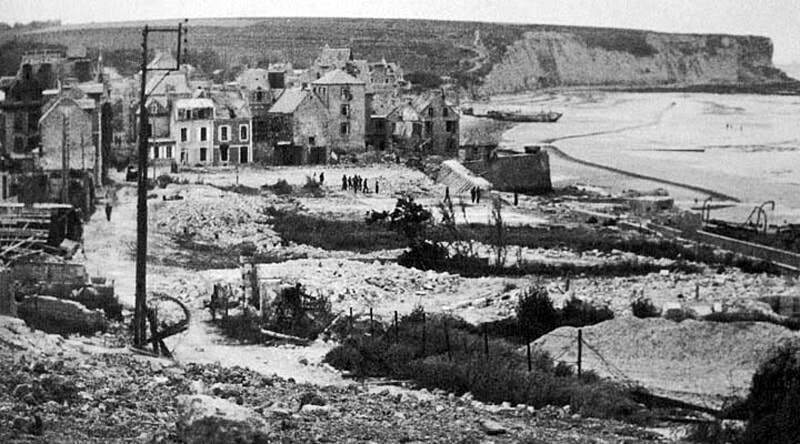 Villa d'Arromanches (below) was chosen by the Royal Navy as their HQ. Note the unkempt garden and the shell hole in the roof. 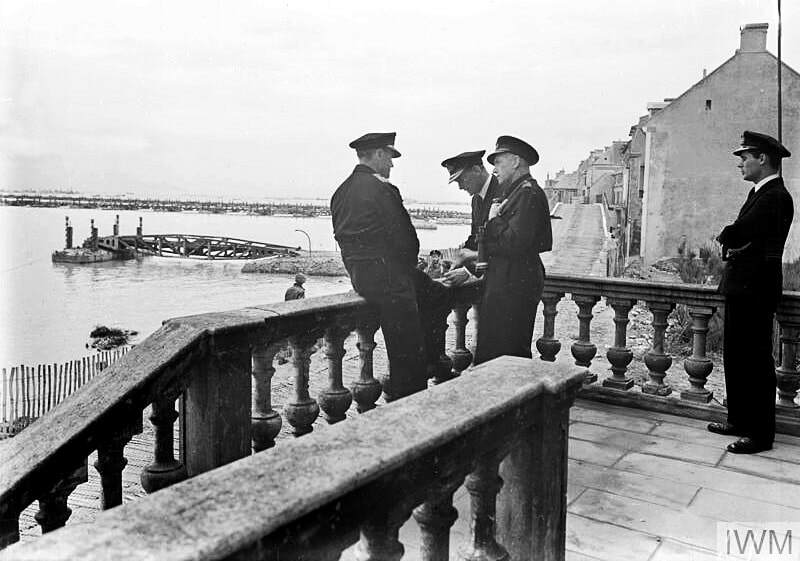 ​​Admiral Sir Bertram Ramsay, KCB, KBE, MVO, Allied Naval C-in-C; Captain H. Hickling, DSO, RN, Naval Officer in Charge; and Admiral Carnac, DSO, Flag Officer British Assault Area, on the seafront at Arromanches. 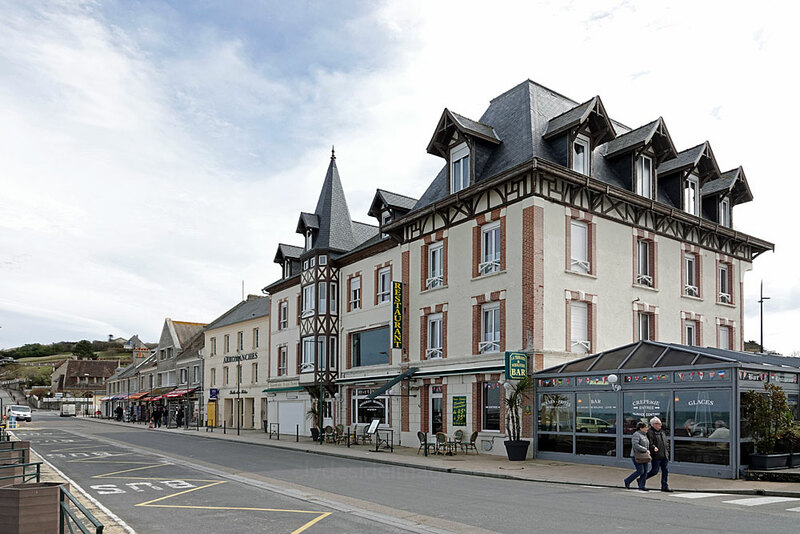 The Arromaches D-Day Museum, also known as Le Musée du Débarquement (below), is the main information centre for the British beaches, having been in operation since 1954, and is worth visiting for the models alone. The superb large-scale representation of a Mulberry harbour runs the full length of the building and there is an excellent working model of the Landing Beaches. Staff give informative commentary in English, French, Spanish, Dutch and German periodically throughout the day. 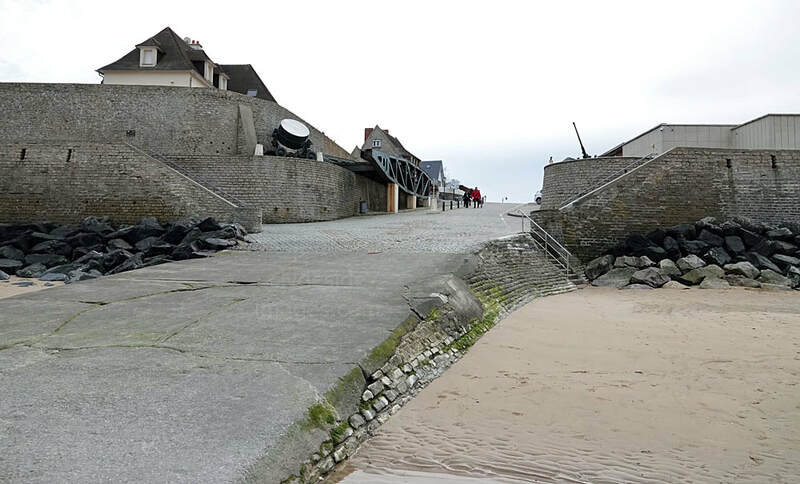 There are armoured vehicles and artillery pieces outside but the main draw is the large number of remaining harbour sections, most of which are uncovered at low tide with several very close to shore. The shot below looks west along the main street from the entrance to the museum. The adjacent pay car park is the best one to use when visiting the town but it`s fairly small and spaces will quickly fill during peak season. This British 25-pounder gun stands guard outside the Museum`s main door. Above: A mobile searchlight and a memorial to Brigadier Sir Alexander Beville Gibbons Stanier, 2nd Baronet of Peplow Hall DSO & Bar, MC (31 January 1899 – 10 January 1995). He fought in both World Wars and during the Great War fought with the 1st Battalion of the Welsh Guards on the Western Front. He was awarded the Military Cross for his actions during the Second Battle of Cambrai, a month before the Armistice. 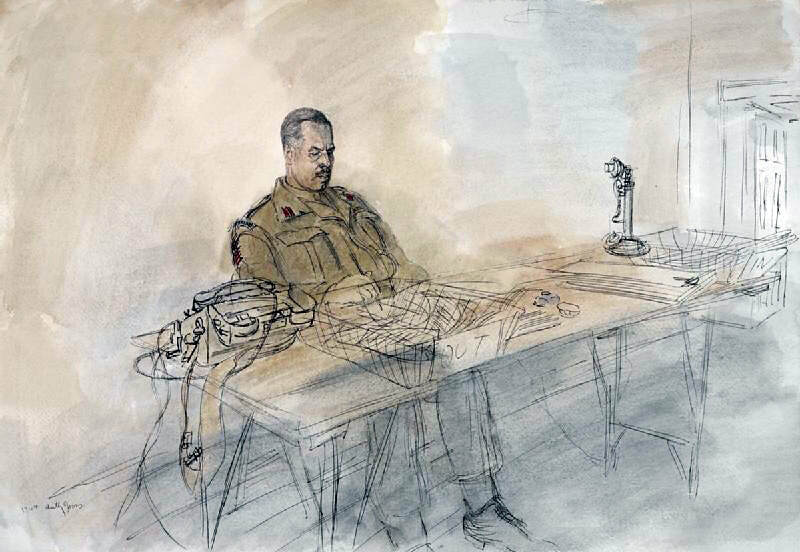 In the New Year of 1944, artist Anthony Gross was commissioned to paint the 50th (Northumbrian) Division preparing for D-Day in East Anglia with the 1st US Infantry Division. The portrait below, held by the Imperial War Museum, shows one of these works, a study of Stainer at his desk, sorting through paperwork. Prior to D-Day, Stanier took command of the 231st Infantry Brigade which was to spearhead the amphibious assault on 6 June. Along with the 69th and 151st Brigade the unit formed part of the 50th (Northumbrian) Infantry Division. 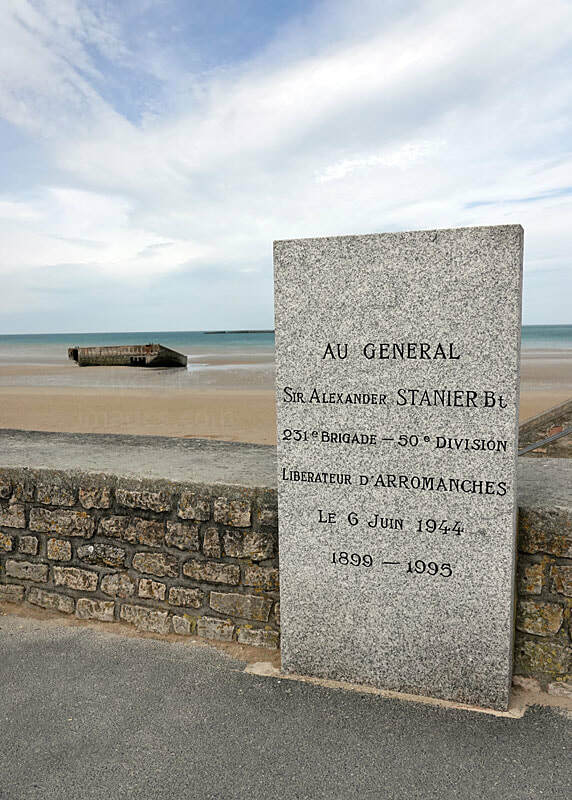 Stanier's force was tasked with capturing 'Jig' Beach, the westernmost section of GOLD, then pushing westwards along the coast to capture Arromanches-les-Bains. 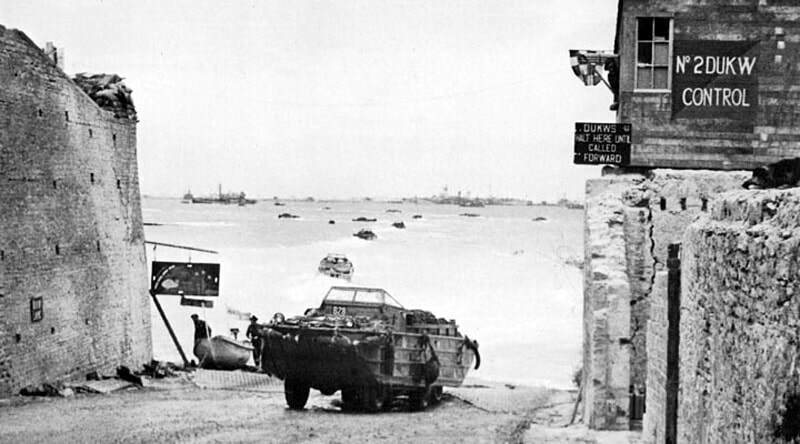 Things didn`t go according to plan from the outset with the first wave of infantry coming ashore at 07.25 hrs without armour support as the swimming tanks had been delayed by the bad weather. A naval bombardment and localised rocket strike by RAF Typhoon fighter-bombers didn`t materialise either. 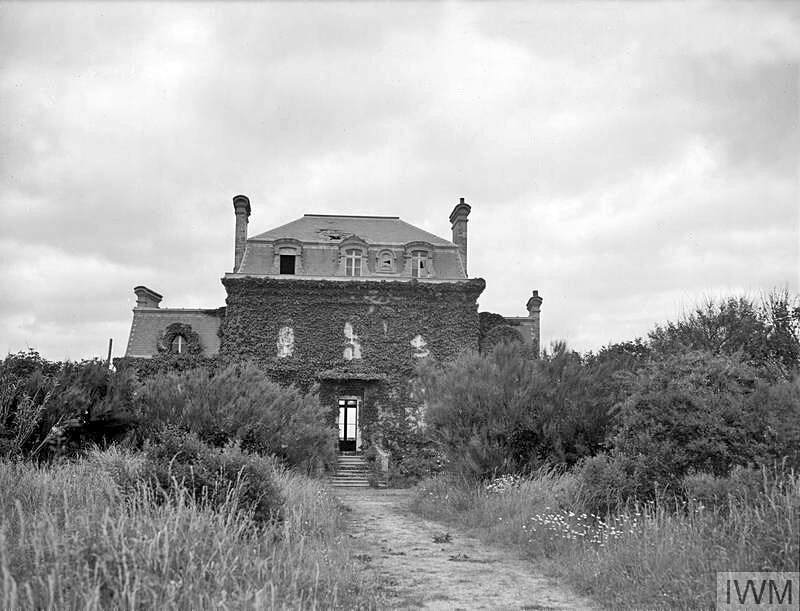 The leading companies of the 1st Battalion, Hampshire Regiment lost their senior officers, and the 231st struggled for 20 minutes with mounting casualties until the rest of the battalion arrived and assaulted the le Hamel position. On their left the 1st Battalion, Dorset Regiment, with the help of flail tanks of the Westminster Dragoons, began to clear beach exits and move inland. 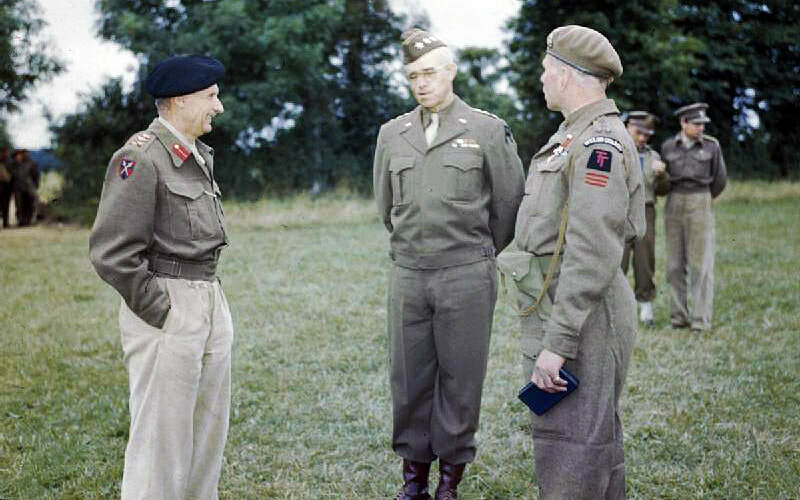 ​Right: General Sir Bernard Montgomery with the U.S. First Army commander, Lieutenant General Omar Bradley (centre), and Brigadier Sir Alexander Stanier at General Montgomery's HQ in Normandy. Brigadier Stanier (side on to the camera) had just received the Silver Star from General Bradley on behalf of President Franklin D. Roosevelt. At about 08.15 hrs on D-Day, the brigade's reserve battalion, the 2nd Devonshires, joined the fray, closely followed by No.47 (Royal Marine) Commando and then Stanier's HQ. 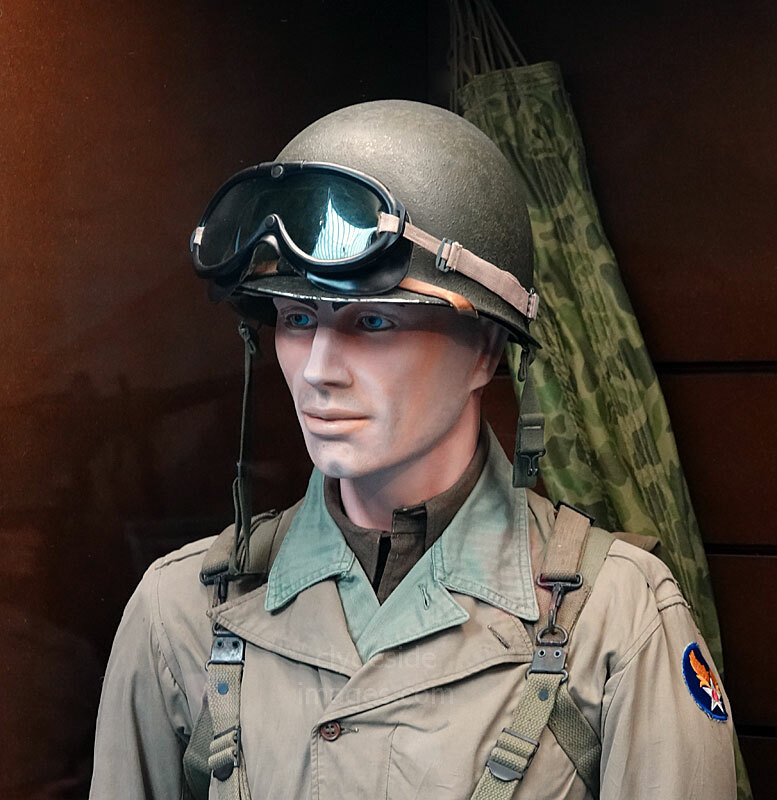 he Commandos lost a number of men and vital equipment during the landing, but set off westwards on their mission to capture Port-en-Bessin and make contact with the US troops beyond, at OMAHA Beach. 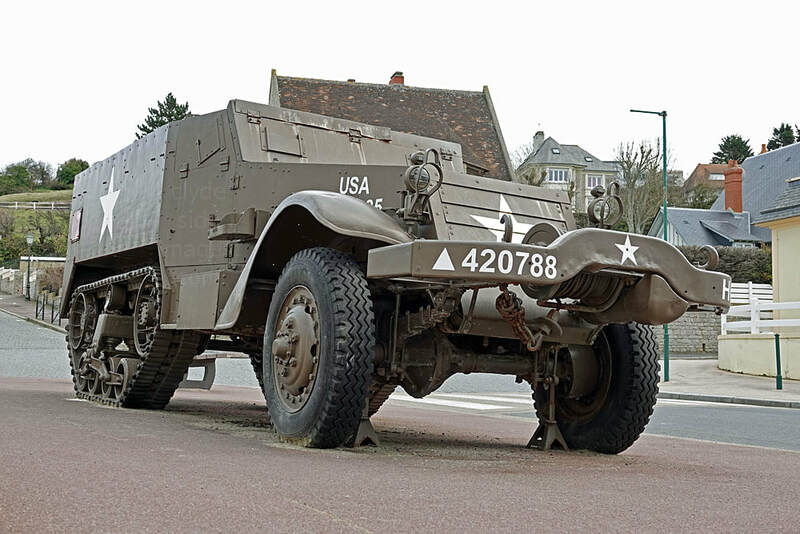 ​Stainer organised a further attack against le Hamel, supported by 147th Field Regiment, Royal Artillery and by nightfall both le Hamel and Arromanches were in British hands. 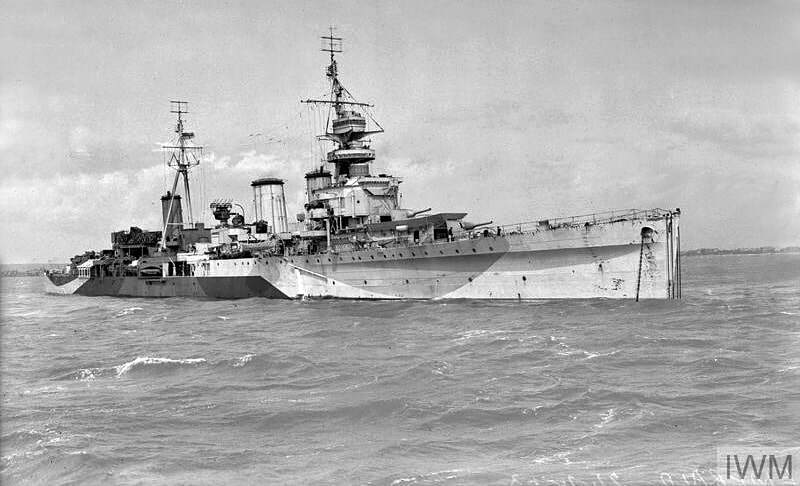 The 231st Brigade had taken the Arromanches radar station and the German artillery battery was abandoned without firing a shot after being shelled by the cruiser HMS Emerald (D66) (above). After the war, Stanier was treated as a hero by the liberated people of Asnelles and Arromanches, who named a town square after him. 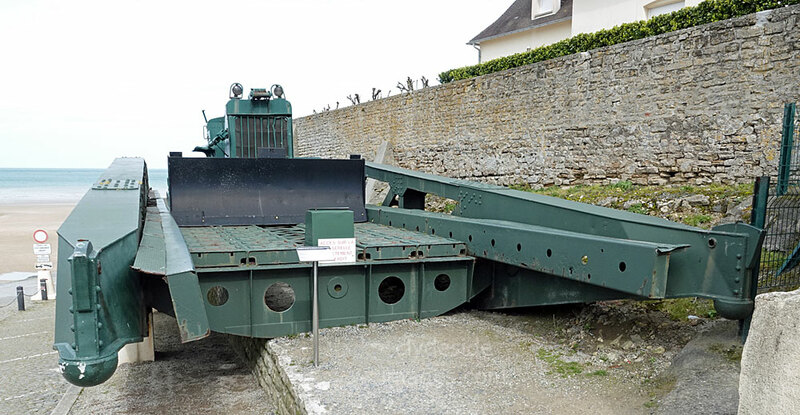 He attended the 40th and 50th D-Day Anniversary celebrations, and was a leading instigator of the Arromanches D-Day Museum. In 1988, he was awarded the Legion of Honour for his outstanding services to Anglo-French relations. Please bear in mind that all images on this website are Copyright. They are not free to use and have been embedded with a digital watermark. Any historic photographs from the Imperial War Museum and other organisations` collections have been used courtesy of a `Share & Reuse` policy and are also subject to copyright restrictions, or are in the public domain. Above: A few of the museum`s internal exhibits. 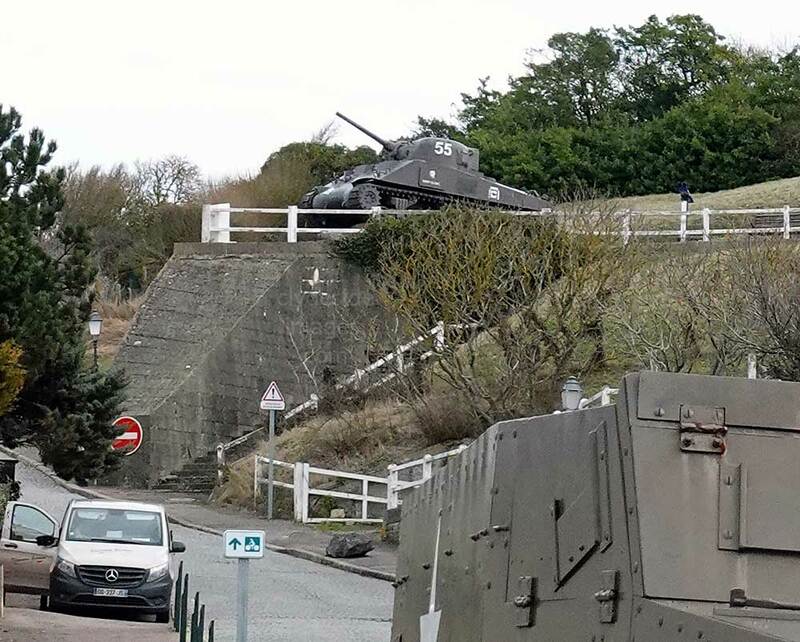 The Sherman tank pictured below is situated on high ground just a couple of hundred yards from the museum.